It is often said that the kitchen is the heart of the home. But no matter where you live, what culture you spring from, or what family lifestyle you choose, you’ll find that just about everyone loves to hang around the kitchen. For this reason exactly, it’s important to consider “child-proofing” this space. When you have small children, there are many dangers that are lurking around every corner. It’s important that as a parent, you keep your home as safe as possible, and that means that it is necessary to take precautions when allowing your little ones to cross that sacred threshold and enter the kitchen. Commercial kitchens are all equipped with a sprinkler system that will automatically activate in case of a fire, but few homeowners actually think about this added feature. However, even an older kitchen can benefit from having a sprinkler system installed or keeping a fire extinguisher handy. Because food preparation often involves oils and heats, the dangers of fires are quite high. Taking this type of preventive measures can help keep your whole household safe. Children have a natural curiosity about them. This could put them at a higher risk as they roam around, touching hot surfaces, or experimenting with sharp edges of knives and other kitchen gadgets. Parents can easily put their mind at ease by blocking access to these different types of equipment with handy child safety locks. These can be installed on doors, drawers, cabinets, etc. to restrict access to any gadgets or devices that could cause harm to a curious child. Tiles can be very beautiful on the floor, but it can also be quite slippery, which often lead to falls and accidents. When you know that you’re going to have young children underfoot, consider other slip resistant materials instead. Cork, wood, rubber, or slate are good choices. If you’re not ready to lay a new kitchen floor, consider getting rubber mats to lay down in the area in front of the sink where water might drip or splash. These can also prevent accidental breakage of glass that can easily slip and fall out of wet hands. Broken shards can lead to cuts and scratches that have the potential of being quite severe. One of the most common tools used in the kitchen is the knife. These can quickly cause major cuts and injuries if you’re not careful. Even adults have suffered from severe injury simply because they didn’t take proper precautions. Getting a knife block to store your knives keeps them from being kept in a drawer where you could reach in and cut yourself on the sharp edges. When it comes to children, no matter how much you plan, there is always a reason to exercise additional caution. In the kitchen, your little ones are exposed to many more hazards that can be found in other parts of the house. 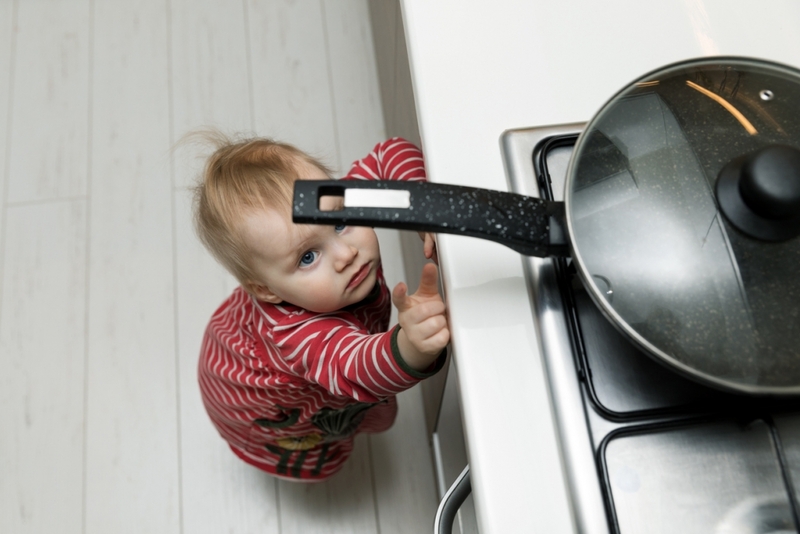 For that reason, it is very important that you always be on the lookout for ways to lower the risks of allowing young children into the kitchen. For all of your appliance repair needs in Marin County, Absolute Appliances Repair has you covered; give us a call (415) 388-0690 at our Marin County location today.